'This is it…the end...it’s over. I have been married for only one week and here I am, drowning on my honeymoon.’ These were my panicked thoughts as I gasped for air, ripping the snorkel tube from my mouth, struggling to keep my head above water. I flailed and screamed, between water-filled coughs, desperate for help as I was sure I was going to die. 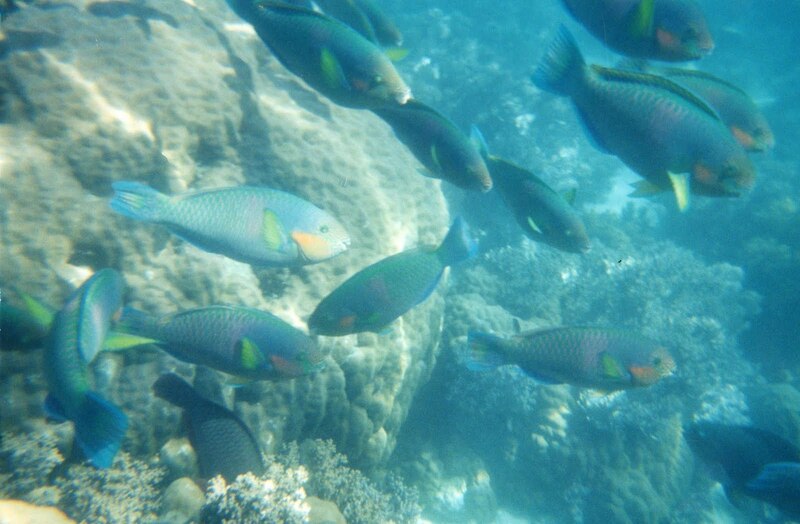 My Great Barrier Reef expedition wasn’t all calamitous. It actually started out quite nice. I was so excited to visit the Great Barrier Reef for my whole life. It was on my life list of things I must do, see or experience. 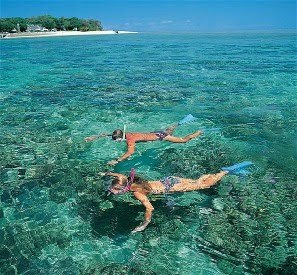 Number 27: visit and explore the Great Barrier Reef, one of the Seven Natural Wonders of the World. Though a bit scared of ravenous and predatory fish, claustrophobic when literally surrounded by fourteen feet-high coral, and a relatively weak swimmer, I was excited for the opportunity to share such an exotic eco-experience with my new husband. We boarded a modern, high-speed catamaran with a group of about twenty other people headed for Green Island, a small, tropical atoll located 45 minutes by boat (16 miles) from Cairns on the Australian mainland. The island is home to the only rainforest off the coast of Australia and a 6,000 year old coral reef. The coral cay is home to 120 species of native plants, colorful bird and marine life, and breathtaking coral gardens to explore. We were instructed by the crew to never, ever step on or touch the coral. Simply touching corals can cause the death of an entire colony. Oils from your skin can disturb the delicate mucous membranes that protect the living coral from disease. Standing on coral can kill the living coral polyps that are the builders of the reef structure and will essentially devastate organisms that have been growing for thousands of years. My better half and I donned our rented flippers, goggles and snorkel tubes and looked something like alien sea creatures. We were told to spit in the goggles to prevent them from fogging up once submerged. I turned to my husband and clarified, ‘so everyone who has worn these before me has spit in them?’ My husband chuckled and shamelessly hawked a generous portion of spit into his goggles. I followed my husband and the rest of our group and did the same. With saliva dripping down my goggles, and my face, I plunged into the crystal clear waters of the South Pacific. The reef extends 1,200 hectares, basically as far as the eye can see. The coral rises up about fourteen feet from the ocean floor, which is shallow near the coast of Green Island, and in some places nearly touched my stomach and chest as I swam above it. In the warm, tranquil waters I saw graceful sea turtles, rainbow-hued reef fish that tickled my skin as they brushed past me, and slithery eels that peered eerily out from the sea grass beds. I bobbed around behind my husband who insisted on getting further and further away from the shore. 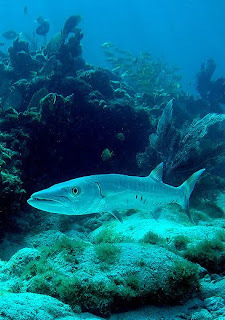 Under water, my husband waved his arms to get my attention and pointed at a giant, menacing barracuda. Its large body was long and silvery. Its gnarling fang-like teeth made for a fearsome appearance. I began to panic as my husband approached the carnivorous fish. I yelled through my snorkel tube for him to stop, inhaling water in the process. I can swim but I’m no fish. Choking from sea water, I began to sink. I was in the middle of a coral garden surrounded by fragile, living flora. Plentiful coral stood just a foot beneath me and offered a place where I could calm myself down and cough up the water I had inhaled. However, I remembered the cautionary speech from the boat and refrained from stepping on or touching the ancient coral. I wasn't going to be responsible for ruining thousands of years of natural wonder! My husband sensed my trouble and came up from his underwater barracuda exploration to help. More concerned with my safety than with the stony organisms below, he stood atop the reef and held me with my head above the water. I coughed up salty water shivering and panic-stricken but after a few minutes I finally caught my breath. Thankfully my knight in shining snorkel gear risked sacrificing an entire coral colony to save my life. Though nature is precious and I would apparently do anything to preserve it, perhaps I shouldn’t have been so reckless with my own life. This eco-trip was a fantastic opportunity to experience the Great Barrier Reef though I’d recommend a life vest for everyone. It not only makes navigating the coral gardens easier and safer it also covers your chest and stomach, which at some points come very close to being scraped by dagger-sharp coral. Lastly, in hindsight, in the event you are actually drowning, I'm pretty sure no one will blame you for gently bracing yourself on the reef to avoid certain death. I sure am glad you made it out! Thank you for sharing your adventure. Sounds fun and about as dramatic as it would have been if I were in your place. The City of Angels Cookie Tour...Heavenly!